Fiona welcomed 47 members and 2 guests. One of our members, Imogen has agreed to be the liaison officer for the celebrations next year and we look forward to hearing what is to be proposed for May and June 2018. In the meantime you can write Thursday, 28th June in your diary for an evening event at RHS Wisley. Fiona thanked Sheila and Miriam for their contributions towards the History Record of Wimbledon WI. This, together with Eileen’s creative craft work has been forwarded to SFWI for inclusion in the Centenary Commemorative Book. We are hoping to arrange something special for our 10th birthday which will probably happen after July 2018. A show of hands voted for an evening event rather than a Saturday afternoon for our own celebrations. Further information to follow. There are still a few spaces for the Brands Museum and Christmas Dinner and one place left for the jewellery workshop at Sutton College (Saturday, 18th November). As usual, please contact Gillian if you would like to go. Please pay for events booked at the next meeting or send a cheque to Gillian. Surrey Residential Designer Taster, Saturday, 10th March – Sunday, 11th March (£155) – An overnight stay followed by a day of “taster” workshops. If you would like further information and application form, please contact Dulcie. NFWI AGM, Wednesday, 6th June, Motorpoint Arena, Cardiff. Please let us know if you are interested and we will send you an application form. Next month will be our AGM when we select our committee. A few committee members may be stepping down so we are looking for volunteers to put their name forward. Anyone can join – no experience needed. So don’t be shy, if you have the time, we would love to hear from you. The NFWI Board of Trustees has set the membership subscription for 2018 at £41. Dual members will pay £20 to their second WI. Payment will be due from members in January 2018. Monday night was a particularly successful evening with members socialising, playing games, answering various quizzes and eating chocolates! A relaxing and enjoyable evening was had by all. 20th November – Matt Bryan, Counter Terrorism. AGM. Christmas Gifts Collection. Charity Rep.
We had a good turnout for the first meeting of 2017 and Fiona welcomed 81 members and one new member. Membership fees were due this month and we will be collecting them again next month. If, for some reason, you will not be renewing your membership please let us know and we will not chase you for payment! Fiona drew our attention to a few events coming up. On Saturday, 25th March we will be having a Quiz Evening at St. Mary’s Church Hall, Merton Park. Tickets will be £12.50 which includes a ploughman’s supper and all proceeds will go to our charity of the year, St. Raphael’s Hospice. Don’t feel you have to make up a table, just come along and make up the numbers on another table. Also there is a chance to see “La Cage Aux Folles” at Wimbledon Theatre on Tuesday, 14th March (£31). There are only a few places left for Grumpy Mole Afternoon Tea on Saturday, 18th March (£14.95) and Longleat on Wednesday 26th April (£45). Please contact Gillian as soon as possible if you would like to go to any of these. Surrey Country Show, Monday 29th May – Various competitions. Contact SFWI HQ Guildford for more details. Art for the Terrified – 8th March (Drawing), 29th March (Watercolours) and 26th April (Oil Pastels). Applications to SFWI HQ Guildford. (One of our members went home after Monday’s meeting to do a bit of research to find out a bit more about Resolution 6 as she hadn’t heard about the issue of plastic fibres. She found the following link very interesting, as well as worrying, and would like to share it. Thank you to everyone who brought in items and bought from the Bring and Buy Sale. We made £202.50 for St. Raphael’s – well done everyone. 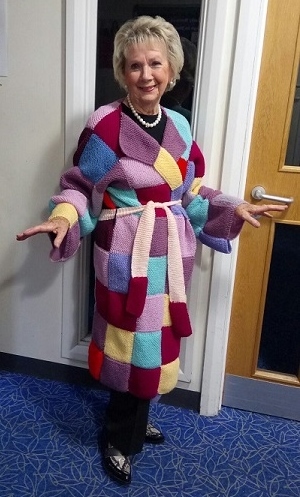 As an alternative to knitted blankets, Knit for Peace suggested making dressing gowns and here is Madeleine modelling the wonderful one she has made. This will now be sent to Knit for Peace to go towards their “Keep Britain Warm” campaign. Well done Madeleine. Fiona welcomed 69 members and 2 guests. Before the AGM and our two guest speakers, the following notices were read out. PARKING: Although there are quite a lot of parking spaces they do share them with the college which has night classes so it is a case of first come first served. BAR BILLS: It would greatly help if people buying drinks could pay by cash as they have only one card machine, which could cause a bit of a back log. ON ARRIVAL: 6:30 for 7:00 please collect your place setting which has on it your name and choice of menu. Julia’s Kenya Trip: Eileen read out the following report from Julia. “Excellent visit to Mbaraka Chembe Health Centre, the teddies, knitted clothes and blankets were a great hit here and at the Kenya Coast Maternity Hospital, Tumaini Orphanage and the Baby Life Rescue Centre at Mombasa rubbish tip. Items needed for December and for next year: more knitted items, teddies and blankets, ALSO BOOTIES. When we visited the schools the Primary loved the tennis balls (thank you Caroline) and the Secondary loved the small amount of stationery we provided. They need A4 lined paper pads, document wallets (manila folders) and scientific calculators. CAN YOU HELP? Thank you so much for your support”. Poppies: Eileen went on to thank Dulcie and her posse of poppy makers for all their hard work and as a result this year £523.75 has been raised for the British Legion making a total of £1,904.25 raised over the last 4 years. St. Lawrence Christmas Fair: Fiona mentioned that this will be next Saturday, 26th November, at Morden Parish Hall from 11.00 – 3.00 and that Wimbledon WI will be having a stall. So it would be lovely to see some of our members and their families. Toy Collection: Fiona thanked everyone who had generously brought in toys for Merton Police Foundation to hand out to the needy children in the borough. AGM: Following a show of hands, indicating WI members’ approval, the existing committee will continue as before with the addition of Sheila. Following a further show of hands, indicating WI members’ approval, Fiona will continue in her role as President. Chris presented her Financial Statement for the past year. The Financial Statement was audited and passed by The Surrey Federation Treasurer – Jane Randell. Fiona proposed the adoption of the Financial Statement. The proposal was seconded by Jill and members indicated by a show of hands that the Financial Statement was accepted by all present. Lys gave a review of the speakers, outings and events that we have enjoyed over the past year. Fiona thanked Gillian and her team for all their hard work of planning and organising the programme. Members indicated by a show of hands that the report is accepted. Fiona spoke about happy and sad events this past year. In particular Fiona spoke about the loss of our much loved and missed president Joanna. Fiona said how much she enjoys being part of our WI and she said she is happy to continue in her role as President. Fiona thanked the committee and all members who have supported her so well over the year. David Cowling, Head of Political Research for the BBC and our first speaker for the evening, gave us an insight into the proposed new constituency boundaries released by the Boundary Commission. Their goal is to reduce the number of MPs by 50, and make the number of people living in each constituency more equal. Their proposals for Wimbledon and Merton would bring big changes and in some respects the Boundary Commission’s own guidelines on community interest and cohesion seem not to have been followed. Wimbledon is split up, with Wimbledon Park and Village joining the Putney constituency. The remainder of the current Wimbledon constituency is joined by Colliers Wood, Lavender Fields, Ravensbury and Cricket Green from the current Mitcham and Morden constituency, which will be abolished, to form a new ‘Merton and Wimbledon Central’ constituency. Lower Morden and St. Helier wards would be absorbed into the existing Sutton and Cheam constituency and Graveney ward into existing Tooting constituency. Several wards in Mitcham will be part of a new Streatham and Mitcham constituency. Under these proposals the London Borough of Merton goes from having two Members of Parliament to five. information@boundarycommissionengland.gov.uk by the 5th December. http://www.straphaels.org.uk/ After thanking Lucia for her very informative talk, Fiona then took a vote, which was unanimous, that St. Raphael’s Hospice will be our Chosen Charity of the year. Knit and Natter: Please note the next session of I Knit at Lower Marsh, Waterloo will be on Wednesday, 30th November and not 7th December. WI Life : Please keep your November issue of WI Life which gives you information on the resolutions which might be considered at the 2017 NFWI AGM in Liverpool. We will be discussing these at our January meeting. So don’t throw away your copy, study it and bring the AM 2017 resolution selection form with you to complete at our January meeting.